When Agents of S.H.I.E.L.D. began this season, we were posed a question: “What Will They Become”. After a heart pounding, nonstop Fall Season, that question was answered on the midseason finale appropriately named “What They Become”. So, what happened? What did they become? This and more as we take a closer look at storylines, symmetries, and overarching structure of this mind-blowing episode. When last episode “Ye Who Enter Here” ended with Skye being taken captive by Ward, you probably got a huge Déjà vu feeling to last season when Skye was kidnapped by Ward and brought before the crazy person he was helping – her father & Whitehall. Heck, Ward even directly compares Whitehall to Garrett. Though as Coulson reminded us when he learned the new, Skye isn’t the same person she was last season. She’s been trained by Agent May and is more than capable of handling herself. Calm, cool, collected. This isn’t the Skye we saw last Season freaking out in the bathroom before she composed herself. This Skye is ready for the challenge from the get go! When handed the Diviner, she doesn’t hesitate to use it against some Hydra agents and spur her father and Ward to follow suit. Though this initial attack fails, Skye and Ward do eventually break free. Previous to this when Ward’s allegiance was questioned, Raina – like the crazy … person she is – spilled the beans about Ward liking Skye and hoping she likes him after her transformation. Considering she doesn’t owe Whitehall this info and she was the one who originally planted this idea in his head during Season 1, it’s strange and yet fitting that she is the one to bring this up. The final parallel to Season 1 – especially the ending episodes – was how things ended between Ward and Skye. In Season 1, Ward threatened to “take what he wants” from Skye and she called in May to take him down. This time around, Ward actually wasn’t the craziest one in the house. In fact, this was the most civil and faithful we’ve seen him in a while. Oh well, too bad because after freeing Skye, she shot him several times in his side. Its amazing how things can change in half a season. This episode we learned more about the relationship between Skye’s mother and father. We not only learn how they met working at the Clinic; but also how Skye’s father tracked his mother all the way to a Hydra base in Europe where he found his wife’s body. This is what we saw a few episodes ago in “The Things We Bury”, but now we hear that there was a long stretch of time in between. This means Skye’s mom was ‘experimented on’ for a few months. It’s no wonder how much her father wanted to kill Whitehall, especially after he threatened to do the exact same thing to his daughter. As I mentioned last week, besides hinting at her true identity, Skye’s dream also brought forward the nature vs nurture debate going on in her head right now. Is she the monster like her father? Will Coulson and May – her adopted parents – turn away and see her as ‘poison fruit from a poison tree’? So you could imagine my excitement when Skye’s father – Calvin – literally said, “Is it nature or nurture” and confirmed all our analyses. Though this went much further than just musings as Coulson and Calvin would soon find themselves locked in battle. Let’s face it, Calvin isn’t the most level headed of people. So whereas most would thank Coulson for shooting Whitehall before he shot them, Calvin freaked out and began to attack Coulson for taking away his prize. For years he’s dreamt of torturing and eviscerating Whitehall; and now – so close – he has it taken away from him by the man who is also acting like a father to Skye. As the battle ensues, Calvin gets the upper hand and is about to kill Coulson when Skye intervenes. Skye might have gotten through to her father by calling him “Dad”; but what followed was anything but a happy reunion as Skye saves Coulson and threatens to shoot if her father doesn’t leave. After some cryptic words about no one accepting Skye after her transformation, Calvin does retreat and Skye admits that she couldn’t bring herself to kill him. Even though she couldn’t kill him, this very act of restraint actually shows Skye choosing Coulson (nurture). When she first tried to reason with her father, she said that Coulson saved him from slaughtering more people. That is what Calvin – or rather Dr Jekyll – is, a merciless killer. Coulson on the other hand might kill; but he’s not a killer in the same regard as Calvin. He shows concern, care and – again as we learned last episode – is a much more kind hearted and idealistic leader than Fury. By Skye NOT skilling her father and letting him go when someone she loved was threatened, she revealed that she is indeed Coulson’s ‘daughter’. There are still feelings for her dad – don’t get me wrong – but she’s chosen Coulson as the driving force. I’ve been pulling for Skye’s Dad to be Dr Jekyll for a while now and after last week’s episode where Skye’s dream played the song “Daisy May” I was almost certain this was the way things would go. So when The Doctor introduced himself to Skye as “Cal” I knew we had all called it as this HAD to be short for Doctor Calvin Zabo. As the episode continued, we waited to hear Calvin reveal her full name as Daisy; but it wouldn’t come until Skye stopped her father from kill Coulson and called him “Dad” for the first time. It’s official, Skye is Daisy Johnson from the comics – the gifted youngster Fury recruited to join S.H.I.E.L.D. – which isn’t too different from her storyline here. As for Daisy’s alternate name, Quake, we’d see the birth of that when she followed Raina into the underground city. Everything Raina has done till now has been to get to this moment. Whether pairing with Garrett, Calvin or crazily rushing to Whitehall’s side – the man who scared her senseless a few episodes ago -, everything has been leading up to her ‘evolution’. Though in order for some to be reborn, others have to die – but not just anyone. When we first saw Triplett and Coulson rushing to the chamber, we thought ‘awesome, they’ll get powers too’; but sadly we were reminded that not all are ‘worthy’. The Diviner wasn’t just the key to transformation – something where a worthy one activated it and all present received its power – but rather the item of transformation itself which would still distinguish between ‘special’ and not. Agent Trip is a fan favorite – as well as one of my favorite characters – and has so many stories to explore. Sadly, the Diviner didn’t see this as he was not only unaffected by the mist, but then turned to ash when he turn around side-kicked the now Crystal Diviner – Terrigen Crystal – and it exploded, impaling him with a shard and turning the unworthy to dust. It was a brilliant juxtaposition to place Skye emerging from her rock tomb along with Triplett’s crumbling to ash. For a moment, Skye – and us the audience – thought everything might work out as Trip could have just been turned into a cocoon like Skye and Raina. Though as Skye emerges triumphantly – with the ability to cause shockwaves – she sees Trips cocoon crumble to reveal that he wasn’t being reborn; but already dead. Having his death coincide with her rebirth will certainly affect her for the next half of the season – as will controlling her new powers which can be seen shaking the temple around her. 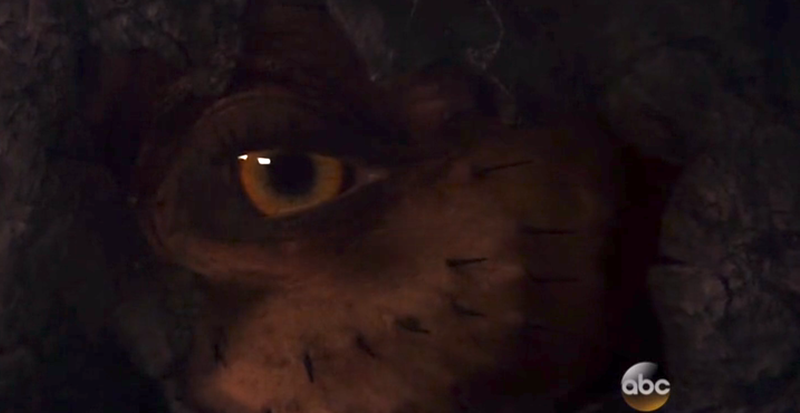 As for Raina, she has yet to fully emerge from her cocoon – fitting since we got to see one death for one rebirth – though we did see some of Raina’s eye break free revealing a somewhat more animalistic look. As in the comics, Terrigen Mists sometimes grant powers at the cost of something else being mutated physically. Skye might be unscathed in that regard; but Raina certainly has a look of mutation about her. 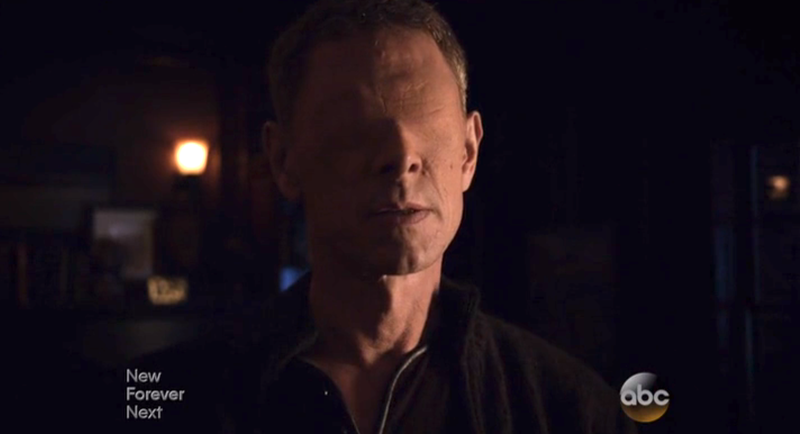 In the post credit of this midseason finale, we were introduced to a seemingly eyeless man with his own Diviner. So who was he and what does this mean? Well, there’s actually A LOT to take notice about this scene. For starters, right before he sees the Diviner reacting, he puts down a book – so he reads – and then once he picks up the phone, he asks a woman if she is seeing this before saying “there’s someone new”. From this we can judge that there are more than 3 Diviners (the one Raina had, the one this man has, and the one this woman has so that she could ‘see it too’). Additionally, we know that there are more of these Inhumans – yes, we have confirmation on this name now – already existing out there. So who’s the man in question. Well, remember when I said we saw him “reading” despite being eyeless? There just so happens to be a VERY recent character addition to the Inhumans comics and he goes by the name “The Reader”. Between him being an Inhuman – with the power to make anything he reads a reality – and eyeless, the facts all seem to point to this being his identity. We got a lot of answers this episode; but also a good amount of loose ends that need tying up. These are all of them. WHAT is the Theta Protocol Coulson told Koenig to enact if they weren’t back? With the city now activating its Terrigen Crystal, Mack seems to have been released from its control. Considering he was being ‘used’ by the temple to do its bidding and protect it, this further leads to him being an Alpha Primitive – who were usually used by the Inhumans as servants. Will there be any after effects? 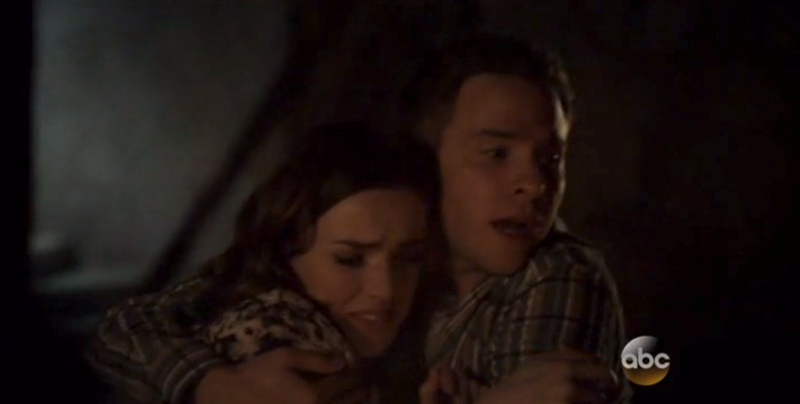 Was that Fitz holding Simmons? Will these two get together already! What is on the thumb drive that Mockingbird is holding onto? What will become of Ward and Agent 33’s new alliance? Where does the newly evolved Raina and the team of other Inhumans play into this? How will the team react to Skye? We actually probably already know the answer to that last question. Her powers might scare some; but Coulson will always stand by her. They had some minor ups and downs this season; but they always come back together. Skye’s father might say he’ll always love Skye; but so too will Coulson. Even if you suspected a lot of these revelations, this episode was no loess mind blowing and powerful. Again, the scene of Skye being reborn juxtaposed with Trip dying was brilliant; but so too was the image of her breaking free. Throw in an emotional soundtrack and you have everything you need to end a feels-inducing midseason finale. *A very special thanks to Gage Slafer for helping research The Reader and his current run in the new Inhumans comics. I’ll admit that I was actually disappointed with Cal here though. Despite his tough talk for the entire episode, he really didn’t look very impressive. Whitehall’s shot would have likely resulted in both of them dying in their confrontation, which is not quite how Cal pictured his big revenge. Kudos for theorizing that Skye was Daisy Johnson earlier in the season because I had no idea about their similarities until then. (I knew about Quake from Avengers EMH, but I knew nothing about her actual character) Well, time for the Agent Carter show to give this title a break for a while. Oh yah, Cal would have absolutely lost against Whitehall – or at least a draw. Unless he has some invulnerability we don’t know about; but doubtful since it was Skye’s mother whom she inherited her abilities from. Either way, he was too blinded by revenge and holding onto his daughter that he always saw it as ‘what someone stole from him’ even if they were helping. Cal is almost 100% confirmed to be marvel’s Mister Hyde. He’s highly durable and resistant to injury. He’d have won. Read more here! Oh I know who Mister Hyde is; but we’ve yet to see the extent to what he’s capable of in the MCU. Remember, in the comics Daisy got her powers because of his mutation. In the MCU Skye’s powers are from her mother. At this current time, Calvin/Mister Hyde just seems to be human – however, that could very well change or be revealed to be otherwise in the second half of the season. Is Skye an inhuman and what do you think is on bobbi’s hard drive? Yup! Despite Skye being Daisy Johnson – a mutant in the comics – here her backstory is as an Inhuman, which will most likely be one of the explanations for those with powers in the MCU since Fox has the rights to the word ‘mutants. That being said, I DONT think Quicksilver and Scarlet Witch in avengers are Inhumans; but rather the results of messing with an Infinity Stone. As for what’s on the Harddrive, no clue. Not much was really hinted about it. It could be anything from something personal to a list of names/information that could compromise things.